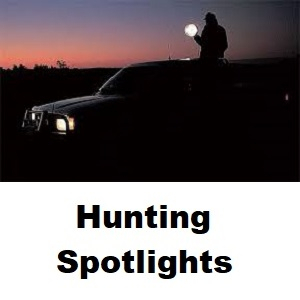 Hunting spotlights from quality manufacturers are available here in many varitaions to suit most hunters chosen field. We supply Lightforce hunting spotlights and Powa Beam hunting spotlights of which are both made in Australia to operate in the harshest of conditions. Powa Beam has been manufacturing the highest quality spotlights since 1969. They are located in a small town called Billinudgel just north of Byron Bay, NSW. Each spotlight is hand focused to ensure a perfect spot from every light. The strong metal construction of Powa Beam spotlights enables them to hold their reputation as being the toughest on the market and spotlight of choice by most professional hunters. There are two main lighting technologies to now choose from. The traditional Quartz Halogen spotlights which are the original Powa Beam spotlights and now the Xenon HID spotlights which are a brighter white light. You can compare the differences and make your own choice.